Of particular interest to the visitors was the Building Information Modelling (BIM) process that involves creating and using an intelligent 3D model to inform and communicate project decisions. As a process that is changing how buildings, infrastructure, and utilities are planned, designed, built, and managed in advanced societies, BIM and its application at QUT provided a new learning experience for the students. 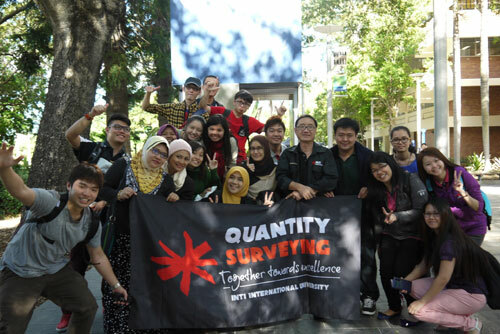 INTI quantity surveying students and faculty members at QUT. “The trip proved to be worthwhile even for visiting lecturers from INTI who accompanied the students. They learned about the cutting-edge CostX software and how QUT lecturers apply it in teaching BIM,” said Yeaw Win Shyang, Head of Quantity Surveying programmes at INTI International University. Students and lecturers from INTI attended several classes related to the topics of Estimating, Measurement and Project Presentation. Here, they discovered that all lectures are recorded and immediately uploaded onto the university’s website, enabling students to review the lectures at any time. “I consider the trip a big success. As a quantity surveying student, I was interested to see how students in Australia, and in particular QUT – a leading university in the field of advanced engineering – went about their studies. 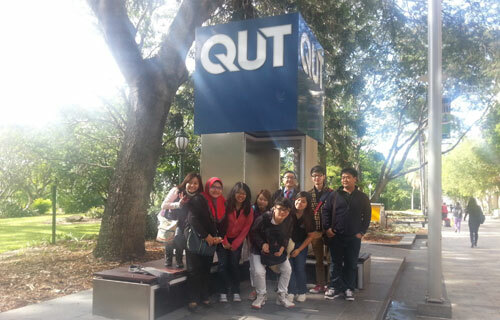 We were fortunate to share the same classroom with QUT students who worked closely together to get their assignments done,” said Yeaw Zhi Jun, one of the visiting students. “At INTI, we want our students’ learning experience to be enriching and one that will empower them with the right skills and attributes to excel at whatever they do, wherever they go. Through their participation in activities such as international study trips, they experience the world in a different ways, make their own discoveries and find their true potential,” said Yeaw Win Shyang. INTI’s BSc (Hons) Quantity Surveying programme is recognised by the Royal Institution of Chartered Surveyors (RICS), UK. This and full accreditation by the Board of Quantity Surveyors Malaysia (BQSM) mean that INTI’s Bachelor of Science (Hons) Quantity Surveying graduates will be able to work anywhere in the world with their degrees.